Services, such as Square, PayPal, Stripe, BlueSnap, Authorize.net etc., allow you to collect payments from your websites. What they don't provide is integrated order forms where you can ask any kind of questions to your customer. For example, if you're selling a service, you'd want customers to enter details about their industry, needs, interests etc. We help you setup payment integrated forms in minutes using a simple wizard. You can access these by clicking the ADD FORM ELEMENT icon then navigate to PAYMENTS tab. 1. First, you need to create or have an account with the payment processor you're about to use. 2. Some payment gateways, such as PayPal standard, do not allow collecting credit card information on your own page, so your forms will simply redirect users to these sites to complete payments. 3. Compare the options — other good options could be PayJunction, 2checkout or Worldpay. Now that we've got the basics handled, let's go on learning the types of order forms we can use on JotForm. How is it work what is the procedure?? I had three people submit payments today for a seminar I am conducting. My payment processor is Square. When I use Square at my office I immediately (within minutes) receive a confirmation from Square via email that payment was received. I have not yet received any notice from Square about the three separate payments that came through with the Jotform. I checked the form submissions to verify at Jotform that the payments were completed. They were. How does Jotform get info to Square? At the end of the day, or as the orders come in? Saya belum paham dengan formulirnya boss,tolong di follow up terimakasih. I would like to add an option for pickup and not have each item have a shipping charge? What is best for reserving a table but we may not charge? We have payments that processed through Braintree that do not show corresponding Orders. Can we search by Customer ID to see what happened to an order? Thank you! Please add support for BluePay. I'd really appreciate it and know I am not the first to ask you all this...people have been asking for years. Thanks! Thank you for the form you created for me. But I still can't figure out completely how you created it. I imported it at least 10 times and then tried to go through the payment wizard, then I tried to make it from the scratch...still no luck. I got as far as realizing that you used the "single product" option, but I can't figure out how to get the subtotal in there. Also, this is just the tuition. You made it show the radio-buttons by making it 2 separate products. But what if there actually is another product? Specifically, $50 Registration Fee. Everybody has to pay that (i.e. checkbox), and then choose the number of hours per week to calculate the tuition. Is this even possible? I tried to add another product (the Reg Fee), but it showed an error message, saying that I can't add anymore products. I'm still hoping it's somehow possible to show both the mandatory Reg Fee and the Tuition options. My problem is, when I try to add the second option, it no longer let's me enter the price for it. While at the same time, it wants me to enter the price for the product itself, i.e. for the "Tuition". But without choosing one of the options, there is no price to show. We would like to schedule an appointment to discuss being a 3rd Integration partner of yours. We would like you to Integrate and promote our Gateway ( info here https://gateway.mymoolah.com/docs/ ), and we can then also promote you to our customers. And we will in return pay you $100.00 with each new sign up. And 35% of the residual monthly income from there credit card processing fees. We are a Registered ISO of Wells Fargo Bank. With Over 25 years of Credit Card processing experience. Is their a good time we can discuss this further on the phone ? 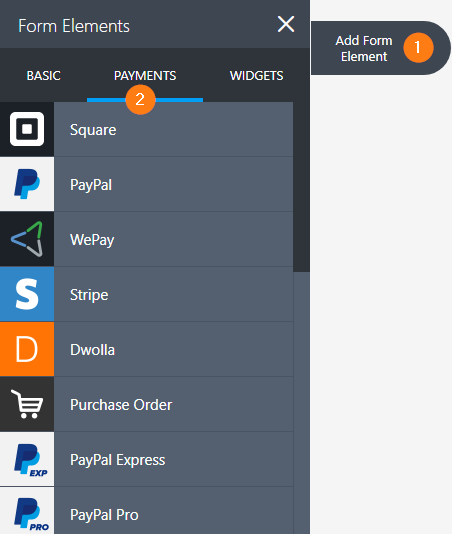 How can I customize the display of payment items? For example I would like to make the price display larger and in bold so that people can better see the prices on things. Authorize.net has multiple choices of developer APIs, and it sounds like your support uses their DPM or AIM choices. They also have "Simple Checkout" which is one item, some qty, and redirected with their button to their site for processing. Can their "Simple Checkout" button be embedded into a form? How can I have people select payment options of paypal, US mail, day of the event, etc? I'd also like to know how to have buyers select from either paypal/credit card or pay by check. Why are there no responses from JotForm Support??? I am selling event tickets. I have it set up to purchase the ticket, but paypal doesn't allow them the opportunity to purchase multiple tickets in one payment. Is there a way to do this on jotform? How can I have people select payment options, say chose between paypal and paying me by check wehn they see me? Can JotForm be connected with the Bank of America payment gateway, Global Gateway/Link Point? We would like to use your product, but it had to connect to this gateway. Is there a way to modify the html code to make this happen? If so, can you provide us with some directions? how do you get these..info? I create a form with authorize.net, but when customers go to the form it's not a secured site. How do I make my form secured? cual me recomiendas para Bolivia? Can JotForm only be connected with the payment gateways listed in the article? We are considering using Wells Fargo as a payment merchant and need to know if that would be compatible with JotForms. I really like the flexibility you offer! Thank you!